In the health care debate, there are three critical areas that policymakers must consider: adequacy, accessibility and affordability. 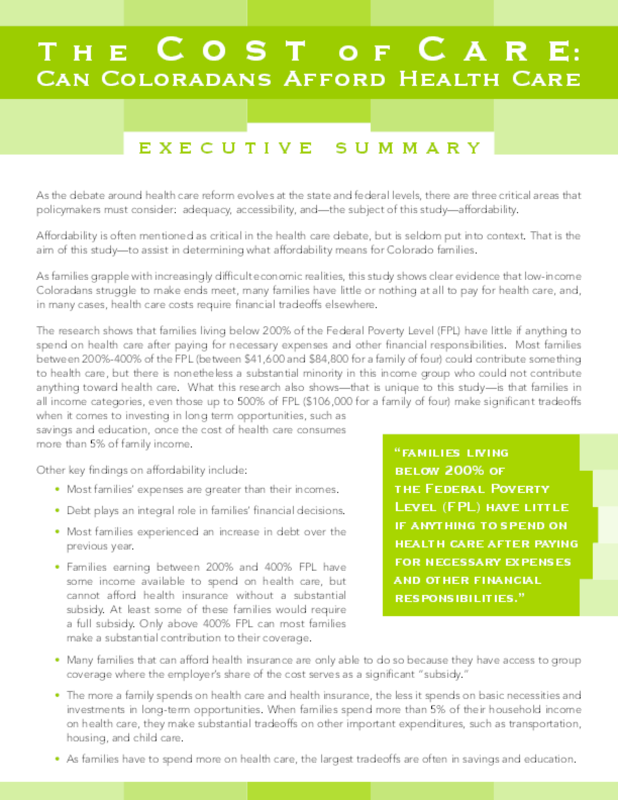 Conducted by the Colorado Center on Law and Policy and its partners at Colorado Voices for Coverage this study explores such questions as: What does affordability mean for Colorado families? How should policymakers address affordability? What definition of affordability ensures that all Coloradans have access to health care? The study is based on research resulting from nearly 100 community budget workshops conducted throughout Colorado, where approximately 1,000 families under 500% of the Federal Poverty Level were surveyed. Copyright 2009 Colorado Center on Law & Policy. All rights reserved.